Anyone who has ever dealt with a garage door problem can tell you what an inconvenience it can be. Worse than a faulty door is the repair invoice that inevitably follows. Unfortunately, there are a lot of things that can go wrong with such a system, and although some repairs can be as simple and minor as tightening a few nuts and bolts, they can also be quite complicated and costly, like replacing springs or the opener itself. Saving money in the long term is all about avoiding the problems that will require a more expensive fix, or at least delaying their onset as much as possible. It may be tempting to pull out your tool belt when something goes wrong with your door, but unless you underwent the professional training required to safely handle this type of system, we would not recommend trying to fix issues by yourself. When it comes to your garage door, the only thing you should do is clear the tracks of dirt and debris, apply the rollers and torsion springs with a bit of lubrication and maybe tighten some of the fastening screws. Anything else should be left to the experts. One wrong move could result in a broken spring or cable, which can send your door slamming down. This could not just cause you to get hurt, but will also significantly damage your door, which would lead to a much more expensive repair job than simply getting the initial problem handled. We get it. Everyone likes to stick to a tight budget, and shopping around for the best prices is perfectly normal. One thing you need to be aware of, however, is that the small amount of money you save when you purchase a new garage door, could end up costing you a lot more in the future. Before settling for the cheapest door possible, consider the quality of the parts used. Quite often, going super cheap means compromising on quality and reliability, which results in more frequent replacements which will quickly end up costing a lot more than what it would have cost to get a better quality door. 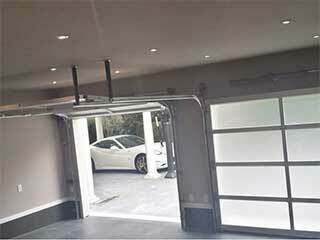 Your garage door is very rarely going to fail you unexpectedly. There is always a warning sign or two that precede a malfunction, such as a slower moving door or a strange noise when the door is in motion. If you witness anything unusual, or know for a fact something's wrong, don't ignore it. Contact our experts at Garage Door Repair Oak Park as soon as possible.